Dr. Jagmohan Singh Varma, MBBS, MD (Internal medicine), DM (Cardiology) is currently Director of Department of Cardiology & a Senior Consultant at Fortis Hospital, Mohali. In his 28 years of professional experience, he has accomplished more than 30,000 Coronary Angiographies and Interventional procedures. 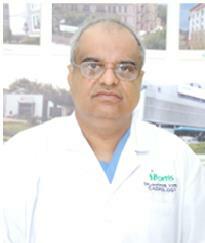 Prior to that, he has served as Head of the Department of Cardiology at PGIMER, Chandigarh. Dr. Varma, has completed his basic medical studies(MBBS) from the world famed Institute, AIIMS, New Delhi, followed by Post graduation – MD (Internal Medicine) & DM (Cardiology) from the prestigious institute, PGIMER, Chandigarh. To his credits, he has contributed more than 75 publications to various national & international journals under the domain of cardiology and has also presented his research work at various conferences world wide. Dr. Varma is a member of various professional associations & actively participates in workshops & conferences to hone his practical skills with latest advancements .